Oil And Gas Analytics Market size was over USD 4 billion in 2015 with forecast of 20% growth from 2016 to 2024. Low crude price coupled with high cost of involvement in E&P of unconventional and conventional resources will drive the oil & gas analytics market during forecast period. Analytic tools help to obtain real time data at low cost and improve production efficiency by 6% to 8%. Abundant availability of unconventional resources in the U.S. will further complement the industry growth. In 2016, Cobalt a U.S. based company has discovered natural gas in the Zalophus 1 well in Block 20 offshore Angola and recent discovery of crude and natural gas reserve by Sonangol could produce up to 2 million barrel a day for coming three years. Expansion of refineries to meet the increasing petroleum product demand may boost global oil and gas analytics market size. In 2016, ExxonMobil announced to expand refining capacity of Beaumont refinery (Texas) with 40,000 barrel by 2018. Increasing exploration and production of oil and natural gas will augment the industry from 2016 to 2024. Strict government regulation to ensure safety during operation will further complement the industry growth. Rising investments in digital technology by O&G companies to increase workforce productivity and reduce cost will encourage oil & gas analytics market share during forecast period. On premise oil and gas analytics market size was valued at USD 1,787.02 million in 2015 and is expected to witness a significant gain by 2024. Hosted deployment is expected to grow over 20% from 2016 to 2024 owing to its cost saving and business productivity enhancement capability of when compared with on premise. 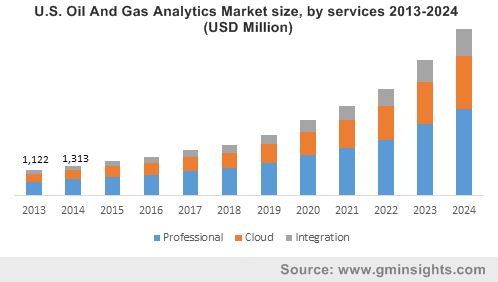 Professional services oil and gas analytics market size was valued at over USD 2,300 million in 2015 and is expected to witness growth over 20% by 2024. Cloud service is expected to exhibit strong growth of over 21% from 2016 to 2024 owing to increasing demand for infrastructure. Cloud provides a faster and more valuable result from other technologies. It also helps to reduce infrastructure cost. Integrated service contributes a significant portion to the overall industry size and is anticipated to reach over USD 3,440 million by 2024. Upstream oil & gas analytics market was valued at over USD 2 billion in 2015 and is expected to grow at a rapid pace of over 20%, subject to increasing offshore and unconventional drilling. Analytics tool enables upstream sector to obtain real time data at lower cost and manage operation in better way through new capabilities, which will propel the industry growth. TIBCO company implemented digital technology to optimize exploration and production cost. Asset Performance analytics for upstream application is expected to reach over USD 1 billion by 2024, this significant growth can be attributed to increasing focus on asset management. It helps to manage risk in asset management, improve asset utilization, reduce maintenance cost and minimize safety incident. Midstream oil and gas analytics market size accounted for 21% of global revenue share in 2015 and is projected to expand further by 2024 owing to escalating demand for midstream infrastructure. It helps to monitor equipment and pipeline and allow precise approach to maintenance. Pipeline SCADA is expected to reach over USD 2 billion by 2024 considering the impressive growth in demand for real time and accurate information and growing pipeline transportation. Downstream oil & gas analytics market size was valued over USD 1 billion in 2015 and is expected to witness growth over 15% in future. Increasing competition among refinery & changing and volatile feedstock are forcing downstream players to implement analytics services. It helps to improve refining and processing efficiency. U.S. oil and gas analytics market size was valued at over USD 1 billion in 2015 owing to expansion of exploration and production of unconventional resources. Increasing numbers of refineries coupled with capacity expansion in India may favor the industry outlook. In October 2016, Indian oil corporation announced to invest USD 2.3 billion to expand its Panipat refinery capacity by 25 million metric tons per year. Angola is expected to witness gains at over 20% from 2016 to 2024. In 2016, it has been estimated that Sonangol holds 2.8 TCF of natural reserve and over 300 million barrel of condensate. For the Europe oil and gas analytics market share, Norway was valued at USD 286 million in 2015 and is expected to grow at over 19% from 2016 to 2024. Rising adoption of digital technology to optimize operation and production cost will drive the oil & gas analytics market share. Major industry participants include Accenture, Cognizant, Drillinginfo Inc., Oracle, Tableau Software, Teradata, Hitachi, Ltd., Capgemini, Cisco Systems, Inc., Deloitte, Microsoft, SAP SE, TIBCO Software Inc., IBM, SAS Institute Inc., Hewlett Packard Enterprise Development LP. Oil & gas analytics is a tool, used to provide actionable judgement by analyzing big data for improving efficiency of upstream, midstream and downstream business process. It helps to provide real time and accurate decision, reduce finance risk, enhance productivity, reduce operation cost and finding main cause of production loss by analyzing data. High drilling and production cost coupled with low crude prices will favor the growth of this industry. Increasing demand for midstream infrastructure will also complement the growth of this market from 2016 to 2024. Availability of large volume of data in O&G industry may further augment the industry during forecast period.